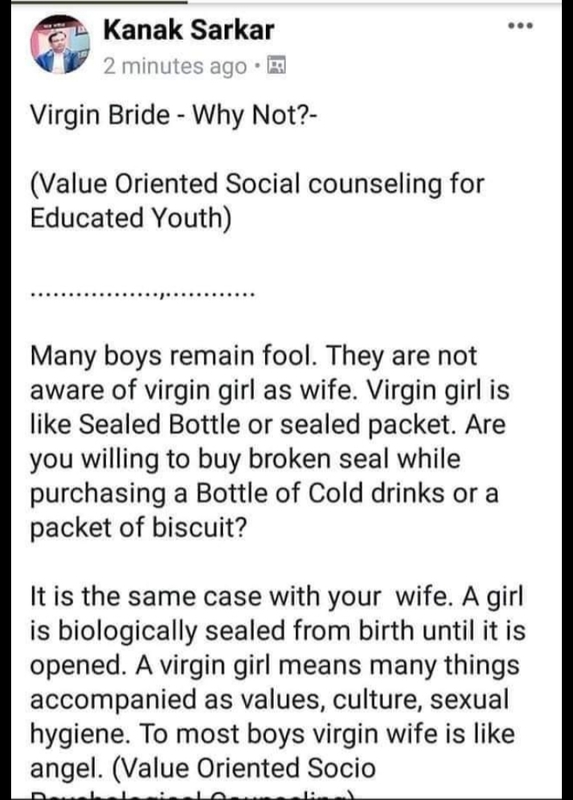 “Will you buy cold drink with broken seal?” Kolkata professor bats for virgin brides on FB. Then deletes post. Kanak Sarkar, a professor of Jadavpur University in Kolkata with 20 years of experience, said that a girl is sealed from birth biologically until someone opens it. Sarkar said that a girl is born “sealed” and that a virgin wife is “like an angel”. Attaching value to virginity, Sarkar emphasised that virginity is as precious as honesty and morality. Kanak Sarkar, who is a professor at the prestigious Jadavpur University in Kolkata, has written several controversial Facebook posts on the topic of a woman’s virginity. Most of these Facebook posts contain misogynistic and sexist comments. 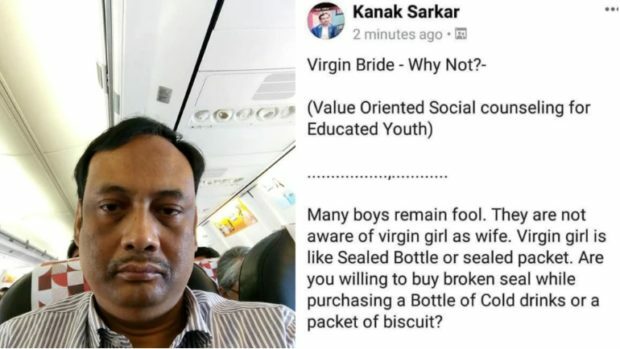 And now, Sarkar is back with yet another eyebrow-raising Facebook post in which he compared a virgin girl to a sealed bottle or packet. Sarkar, who has more than 20 years of teaching experience and a doctorate, said that a girl is born “sealed” and that a virgin wife is “like an angel”. “A girl is born sealed from birth until it is opened… A virgin girl means many things accompanied with values, culture, and sexual hygiene [sic],” Sarkar said. Kanak Sarkar deleted this post but the evidence of his misogyny is is still there on Facebook, for all to see. 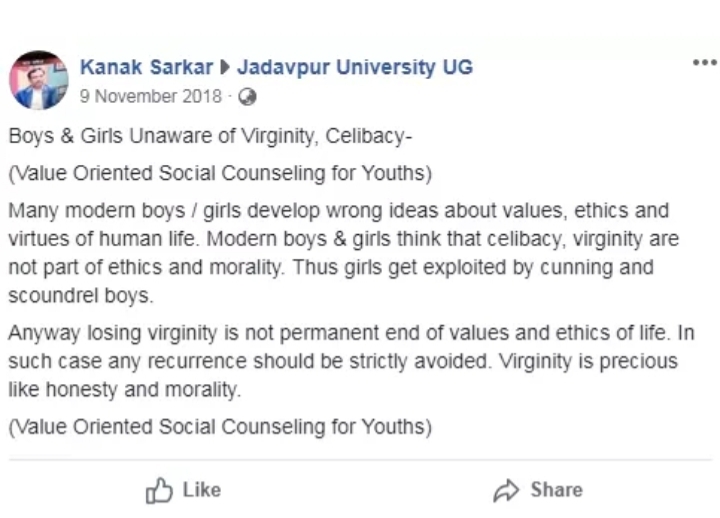 In a Facebook post from November 9, Sarkar had said that boys and girls these days think that celibacy and virginity are not part of ethics and morality. This is the reason that girls end up being “exploited by the cunning boys”, Sarkar had said. In another post, this one from December 22, Sarkar equated virginity with dignity and said that if a woman is a virgin before marriage, she should be proud of it and celebrate. “Express your virginity during marriage negotiation or during love affair or even in married life. I am sure you will be honoured by your husband or lover,” Sarkar wrote. “Every man respects and aspires for a virgin wife. To the men folk, virgin wife is like angel. Women should know this fact,” Sarkar said. As an example of preserving virginity among girls, Sarkar cited the Japanese as an example. “They proudly claim that 99 percent Japanese girls remain virgin till marriage. Japanese society is so progressive and developed,” Sarkar said. Then, once again, on January 12, Sarkar reiterated that a woman should remain virgin until she marries. “Unfortunately, many women are found breaking their virginity and men breaking celibacy before marriage,” Sarkar said. Blaming modernity and the western society for such actions and not the narrow-mindedness of harbouring such ideals, Sarkar said that loss of value of virginity was due to the general ignorance of the social values. Interestingly, Kanak Sarkar has also been accused of sexual harassment, according to posts on Facebook. However, the details of these allegations are not verified.